I've had a very productive week.Today my monsters come home and my house will be destroyed. And yet, I still need to clean it before they arrive. I have to give back the kitchen table and I suspect that my parents and children will want a meal cooked for them tonight! And I'll have to hide the rest of the Turkish delight from their tiny paws. I've been up since about 5am making lists and finishing jobs. I have a few odd jobs to complete for work, but I have a pile of bills and paperwork that need sorting. Vacume cleaner to be fixed, car to be cleaned before the booster seats go back in. OH that sounds like such an inspiring day to you all I bet. I might squeeze in a pedicure as sandal season is now approaching. yes, a nice few days of peace and some work crossed off the list. I bet my parents are exhausted. I'll be uploading the shop/s throughout the week, infact I'll be making a big effort to keep on top of some works for the next few months. I spent yesterday with a friend of mine selling some bits and pieces at a local country market. The joy of just being out of the house before breakfast rush hour was a treat and away from coughs and sniffles. I've decided to have a stall at the Mathilda's markets here in Brisbane on November 1st, so if you are in town, pop in and say hello. I picked up a copy of Home Beautiful this morning after my artwork was spied in a lovely nursery that is featured in a South Australian home. 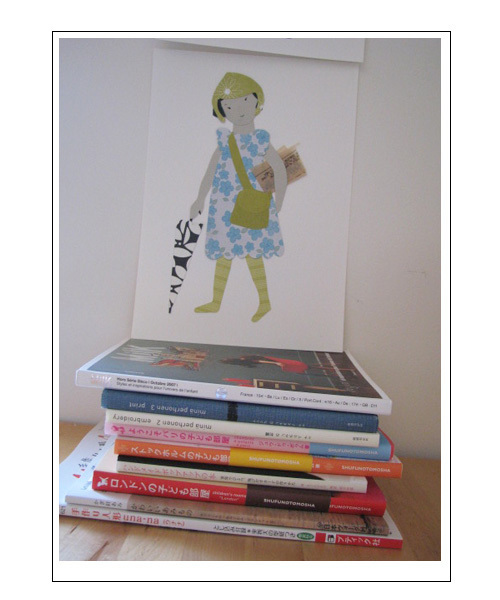 It is so rewarding to see my own work in someone else's house. On the back wall are two of my sewn shoes (this is one). Apart from that, I've been working on some new works from paper dolls, to birds and a new found theme I am exploring is cacti! Time to finish work and projects on the go. Time to reflect on the why, the when, the what for. Time to catch up with friends. Time to say goodbye to little classmates. Time to really clean up the house, not just move piles from one spot to another. Time to stay away from big, ugly shopping centres. Time to try and think of something really great to give to Mr N for his birthday. Time for just keeping cool in the pool. Time to think about wanting to work on new projects. Time to stop thinking about wanting to work on new projects and just learn to relax. Lotta, Pony girl and Patricia. finally I have a few moments on this mother's day to catch up on my very long list of things to do. I'm enjoying my day by the way. Lovely little presents received. Breakfast in bed, followed by tickles with both the kiddies. I can't escape the washing that is heaped up in piles everywhere and I don't trust anyone else in the household to do it! So before the little munchkins come home from their bike rides in the park with Mr N, I will get back to the list. 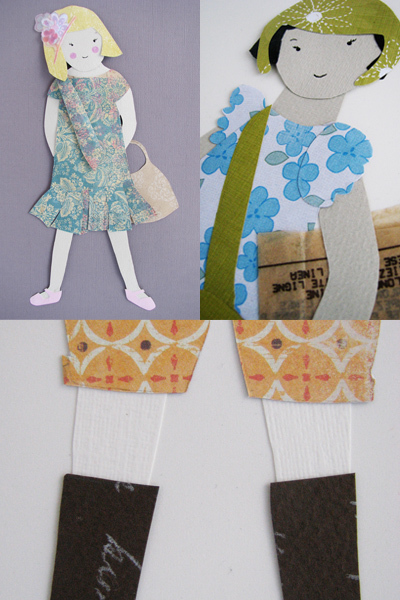 Now available in the shop are 3 original paper dolls, Lotta, Pony girl and Patricia. What I thought was a bit of jet-lag I think is actually a virus. This week has seen me in bed most nights around 7.30pm. Last night I made it to 9.20pm (Saturday party girl that I am). Miss M, who actually is a party girl, was playing quietly in her room, and became a little miffed to discover that everyone had gone to sleep before her. So she came in to tuck both Mr N and I in bed. She is frustrating and funny at the same time. It has been a slow day, but whilst the kids were at the park this morning kicking around a ball, I did manage to start some new illustrations.